Palm reading, otherwise known as palmistry or chiromancy, is practiced all over the world, with roots in Indian astrology and gypsy fortune-telling.The objective is to evaluate a person's character or future by studying the palm of their hand. Whether you're an aspiring palm reader or you're just looking for a fun way to pass the time and impress your friends, here's how to gain insight just by holding someone's hand.. Choose a hand. For females, the right hand is what you're born with, and left is what you've accumulated throughout your life. For males, it is the other way around.For male, the left hand is what you're born with, and right is what you've accumulated throughout your life. Pick a palm to read. Identify the four major lines. Interpret the heart line. This line can be read in either direction (from the pinkie finger to the index finger or vice versa) depending on the tradition being followed. It's believed to indicate emotional stability, romantic perspectives, depression, and cardiac health. Begins in the middle - falls in love easily. Examine the head line. Represents learning style, communication style, intellectualism, and thirst for knowledge. A curved line is associated with creativity and spontaneity, while a straight line is linked with practicality and a structured approach. Separated from life line - adventure, enthusiasm for life. Evaluate the life line. Begins near the thumb and travels in an arc towards the wrist. Reflects physical health, general well being, and major life changes (e.g. cataclysmic events, physical injuries, and relocations). Its length is not associated with length of life. Swoops around in a semicircle - strength and enthusiasm. Study the fate line. This is also known as the line of destiny, and it indicates the degree to which a person's life is affected by external circumstances beyond their control.Begins at the base of the palm. Determine the hand shape. Each hand shape is associated with certain character traits. The length of the palm is measured from the wrist to the bottom of the fingers. Note the texture of the hand, front and back. Soft hands signify sensitivity and refinement, while rough hands signifies a coarse temperament. Take out books from your local library and look up websites on the internet. The more you read, the more you'll know and the better you'll be able to palm read. Try practicing on your own hands or on family or friends. 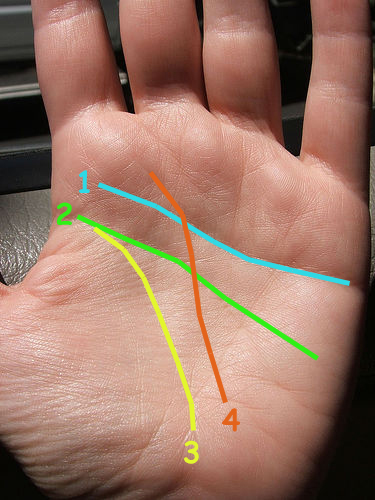 Remember that palm-reading is for entertainment purposes and there is no substantiated evidence of correlation between palm features and psychological traits. If you are going to do this, then keep it light, don't make any dark predictions that will make people worry. Also, make sure you read palms in the light because trying to do it in the dark makes it difficult to get a good read.